Hide this Dealer (Vijeta) Discover properties by other dealers by hiding those whom you have already spoken to. You won't see them in your searches further but you can unhide anytime later. Hide this Dealer (Manna) Discover properties by other dealers by hiding those whom you have already spoken to. You won't see them in your searches further but you can unhide anytime later. Hide this Dealer (Pradipta Kumar Das) Discover properties by other dealers by hiding those whom you have already spoken to. You won't see them in your searches further but you can unhide anytime later. Hide this Dealer (Sharda Ranjan Prasad) Discover properties by other dealers by hiding those whom you have already spoken to. You won't see them in your searches further but you can unhide anytime later. Hide this Dealer (J S Vishnoi) Discover properties by other dealers by hiding those whom you have already spoken to. You won't see them in your searches further but you can unhide anytime later. Hide this Dealer (Bijoy Sinha Roy) Discover properties by other dealers by hiding those whom you have already spoken to. You won't see them in your searches further but you can unhide anytime later. Hide this Dealer (S Das) Discover properties by other dealers by hiding those whom you have already spoken to. You won't see them in your searches further but you can unhide anytime later. Hide this Dealer (Samrat Basu) Discover properties by other dealers by hiding those whom you have already spoken to. You won't see them in your searches further but you can unhide anytime later. Hide this Dealer (Sandeep Ghosh) Discover properties by other dealers by hiding those whom you have already spoken to. You won't see them in your searches further but you can unhide anytime later. Hide this Dealer (Debasree Roy) Discover properties by other dealers by hiding those whom you have already spoken to. You won't see them in your searches further but you can unhide anytime later. Rameswara Waterview by Rameswara Group is a residential project by the Rameswara Group. The project offers very well designed 2BHK and 3BHK residential apartments. The project is well connected by various modes of transportation and has almost every civic utility. Situated next to Subhash Chandra Bose International Airport, Rajarhat is a popular locality among buyers for residential real estate. Availability of basic infrastructure, proximity to the IT hub of Sector V and the upcoming metro project are some of the reasons that contribute to the popularity of this location. Rajarhat has a lot of potential to tap home buyers. The developing locality has the basic infrastructure already place contributing largely to the realty growth. Rajarhat, a part of New Town that is a satellite city of Kolkata has all basic facilities, such as schools, hospitals, banks, restaurants, shopping malls, etc are present in the vicinity. The capital city of West Bengal, Kolkata is known for its grand colonial architecture, cultural festivals and art galleries. The area is divided into North, South, East and West Districts and Kolkata south witnesses? highest demands in terms of real estate. Proximity to major business centers, connectivity, and infrastructure developments are the major reasons that the buyers are attracted here. Based on the east shore of Hooghly River, Kolkata defines culture and festivities. It is the main financial and commercial hub of North-East India. The strong transport network and ferrous infrastructure have listed Kolkata in top Indian city in terms of the well-planned public transportation network. From residential apartment to luxury homes, Kolkata offers a variety of option to the home-buyer. The property rates in Kolkata is much lower in comparison to other metropolitan cities of the nation. The city has received positive sentiments in demand of real estate. In the April-June 2015 quarter the average rates of property in Rajarhat mounted at Rs. 4050 per square foot while for the January ? March 2015 quarter, the value was Rs. 3950 per square foot. The last quarter of 2014 witnessed average property rates of Rs. 3850 per square foot. Floor Plan: 850- 1350 Sq. Ft.
2 BHK apartments at Runwal Codename Walk are available in a price bracket of Rs Rs.28.05 - 29.87 Lacs and a 3BHK apartment is available at a price of Rs.34.65 - 40.33 Lacs. The amenities at Rameswara Waterview include a club house, gym, swimming pool, and facilities for different sports, landscape gardens, play area for children and a number of facilities like security systems, lifts, parking space and paved compounds. One of the pioneers in real estate sector of Kolkata varying markets over the last forty years. The group has its presence across every vertical of real estate developments such as Residential Condominiums, Shopping Malls, Commercial Buildings, Industrial Parks, Resorts and Hospitality projects, Schools, Integrated Townships and much more such iconic developments which have changed the skyline of the city and the lifestyle of the people living in them. Where is Rameswara Waterview located? Rajarhat, a prime residential locality for house seekers in Kolkata East. What apartment sizes are available in Rameswara Waterview? The project offers apartments sized between 850.0 sqft and 1315.0 sqft. 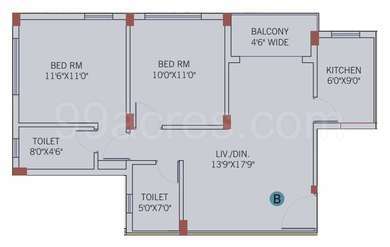 What is the area of 2 bhk in Rameswara Waterview? 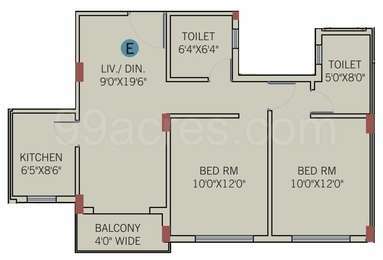 The size of a 2BHK unit in the project ranges from 850.0 sqft to 910.0 sqft. 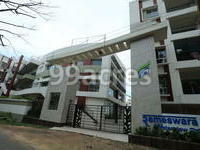 What is the area of 3 bhk in Rameswara Waterview? 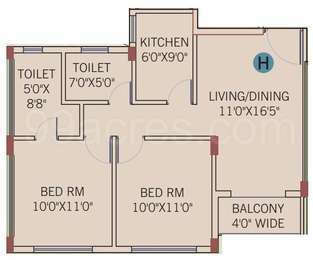 Three-room units (3BHK) in the project are available in an area of 1050.0 sqft to 1315.0 sqft. How much is the actual area of Rameswara Waterview?The area of the project is 4.5 Acres. What is price of 2 bhk in Rameswara Waterview? 2 BHK apartments in the project are available at a price of Rs. 2850750 to Rs. 3750000. Rameswara Group has been serving the people of Kolkata city from the past forty years. They have developed projects in residential and commercial properties. Also, the team has undertaken certain projects from Hospitality, Hotels, School, Industrial Parks, and Resorts. They aim to provide the best homes at the best location with impeccable designs and quality to all its consumers. The builder works with the support of its skilled staff of engineers and consultants who enable success for every project. d by Mr. Jugal Kishore Khetawat with a vision to present first class luxury projects with a timely delivery. The team has developed a number of high-rise developments in the city. Some of the residential projects that are aboard for the buyers are Rameshwara Mansion, Alpine Heights, The Residence, Garden Apartment. Dear, Is there any owner group either in google , whatsapp, facebook, or in anywhere else?